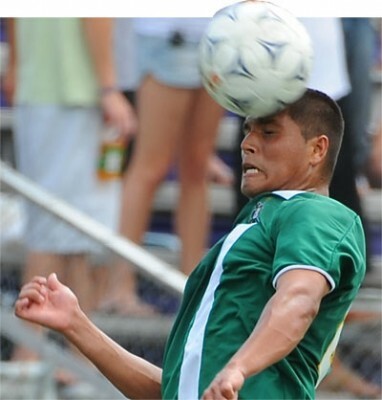 The 2008 men’s soccer season was a memorable one for the Belhaven Blazers. The team renewed a campus tradition by playing select games in “The Bowl”, which was the home of Belhaven soccer for many years. The season has been filled with many on the field successes, including a 12-game winning streak. The Blazers won their first game of the year 2-0 over Tennessee Temple and then played to a 1-All tie with Covenant. At that point, Belhaven proceeded to reel off 12 straight wins and push their overall record to 13-0-1. During that stretch, the team was consistently ranked in the Top 25 and reached as high as number 6 in the country. Over the course of the 12-game winning streak, the Blazers topped rival William Carey University 1-0 on the road. The Crusaders were ranked 15th in the country and the Blazers had just cracked the Top 25 at number 23. The win was crucial in setting the tone and building momentum for the rest of the season. Other important wins during the winning streak included a road victory over NCAA Division II Delta State University 2-1 and a home win over NCAA Division II Ouachita Baptist 6-0. Win number 13 came against Lee University which has become a rival for the Blazers in the past few years. The game was a hard fought defensive battle that neither team was willing to lose. The lone goal of the game was scored on a penalty kick by junior forward Juan Rodriguez with about 32 minutes to play in the game. It was a great win for the team and especially the seniors who were playing their final regular season home game. Juan Rodriguez provided outstanding offensive production for the Blazers in 2008. Rodriguez was near the top of the record books for the most goals and most points in a season. He also won the Gulf Coast Athletic Conference Offensive player of the week honor three times. Goalkeeper Zach Wallace also had a special season for Belhaven, reaching double digit shutout wins and becoming one of the leaders in fewest goals allowed in a season. 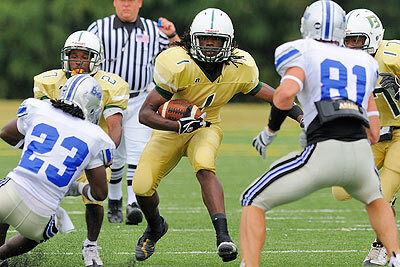 Wallace joined Rodriguez in being named GCAC Defensive Player of the week three times during 2008. The good news for the Blazers as they look ahead to 2009 is that both Wallace and Rodriguez will be back as seniors. Kameron Young, Sergei Yepishin, and Alan Hannon will also be back to help the Blazers in 2009. However, the team will miss the defensive presence of Defender Ricky Machel, Defender Jamie Caul, and Mid-Fielder David McKay as all three players will be graduating this spring. The Belhaven women’s soccer team has had a solid season under first year Head Coach Josue Sabillon. The team was led by a solid group of senior players: Goalkeeper Kristin Parson, Defender/Midfielder Morgan Jackson, Defender Mallory Hodges, and Midfielder Catherine Dunst. They provided great leadership for the 2008 team. Belhaven jumped out of the gate strong, beginning the season with five straight wins, including a 2-1 overtime victory at Covenant College in the second match of the year. The Lady Blazers faced some strong competition in the strong Gulf Coast Athletic Conference, but they held their own in league play. Juniors Dana Sullivan and Nicole Trawick led the Lady Blazer offense, while senior Kristin Parson provided outstanding play in net for Belhaven. The Lady Blazers will bring back a solid group of players next season, including Sullivan and Trawick, who will return for their senior season. The 2008 volleyball campaign has been filled with challenges, but the team continued to improve each night on the court. The season began with only two senior players, and the remaining roster spots were filled by freshmen. One third of the way into the season, senior Ku’ulei Moses suffered a season ending injury. The last remaining senior, Kelsey Stack, did an excellent job leading the group of younger players for the rest of the year. The Lady Blazers opened the season on a high note, knocking off NCAA Division I Alcorn State in three games. Belhaven then lost four in a row before defeating Paul Quinn and Millsaps to raise their record to 3-4. Then the Lady Blazers suffered from injuries and tough competition and dropped the next nine matches. The team ended on a high note, however, when the team picked up wins over Martin Methodist, Virginia Intermont, Dillard University, and local rivals Millsaps and Mississippi College. It was a season of close calls for the Belhaven football team, with a number of games being decided by just a few points. Led by Senior Wide Receiver Anthony Embry and Junior Quarterback Jerred Wallace, the Blazers’ “Air Invasion” offense continued to thrive. The defense was led by senior defensive end Eric Ortiz who stayed close to the ball or applied pressure on the opposing quarterback. Senior Linebacker Reginald Lumpkin was also an important and consistent member of the Blazer defensive unit. The season got off to a challenging start with four straight losses, including setbacks to NCAA Division II West Alabama and Millsaps College. After a strong second half comeback in their loss to Bethel, the Blazers put things together the following week, upsetting Faulkner University 49-24 for the first win of the season. Belhaven followed that up with a victory over West Virginia Tech 29-27. Belhaven has a strong nucleus of players returning next season with quarterback Jerred Wallace, running back Ricardo Bolton, and wide receivers Barry Johnson and Shaun Ector on offense. Defensively, the Blazer returners include Bacqui Thomas, Elarence Vinson, Marquis Browdy, Melvin Dyson, and Eric Ducksworth among others. Belhaven Head Coach Don Lee has reason to be optimistic about the 2009 season, as he returns a solid group of veterans as well as fresh talent for next season. All of your Posts were pretty passionate. Fun read. Knowledgeble information. I found your Blog a work of love. Keep up the good work. Good Job!